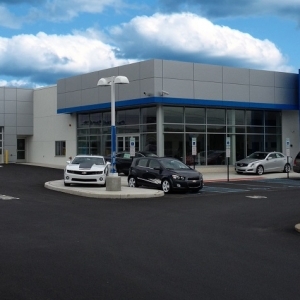 The Faulkner Chevrolet, Cadillac Dealership is comprised of a new 21,600 square foot showroom and service building to replace two existing showroom buildings providing a single location for sales and service for both brands. Work on this project included obtaining approvals from the Lehigh Valley Planning Commission, the Township and the Northampton County Conservation District. In order to limit the amount of earth disturbance for this project, a very limited amount of disturbance around the new building was proposed. As a result, this project was exempt from PADEP NPDES permitting requirements.